History: Originally named ” La Punta de la Loma de San Diego, ” later anglicized to ” Point Loma. ” Prior to 1542, the land is not believed to have been visited by any persons, including indigenous Kumeyaay Indians. On September 28, 1542 Portuguese pilot and navigator Juan Rodriguez Cabrillo led an expedition from Spain and landed his flagship on the east shore, most likely at Ballast Point. Old Point Loma Lighthouse is perhaps the best known landmark in Point Loma. Perched atop a ( windy, fog prone ) southern point that creates a natural entrance of San Diego Bay with Coronado. The small two story lighthouse began operations on November 15, 1855. 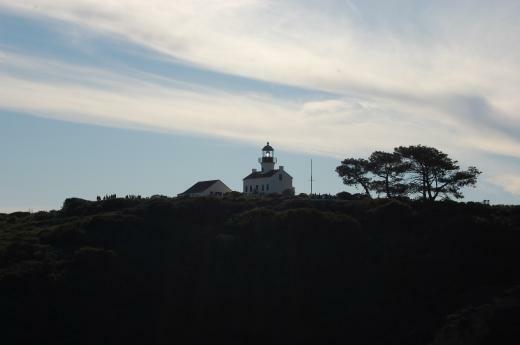 On March 23, 1891 ,after only 36 years, Point Loma Lighthouse ceased operations. Upon operation it became clear the location chosen for the lighthouse was poor. Prone to fog and thick marine layer clouds, the lighthouse beacon was often obscured and unseen by ocean going vessels. The restored light house is now a popular tourist attraction. The ghost of Old Point Loma Lighthouse: Reported by visitors, was suspected of being haunted. Claims included sounds of heavy foot steps coming from upper rooms (while in first story kitchen or living room); Cold spots were felt at entry landing to the spiral staircase; A moaning breath was heard in both bedrooms. This site is no longer considered an “Active haunted” location. Several different names were attributed to the suspected haunt including Juan Rodriguez Cabrillo! The most likely mentioned name is that of final lighthouse keeper, Captain Robert Decatur Israel. Captain Isreal did not pass away at the light house. The belief is that Captain Isreal’s spirit returned to his lighthouse duties even after death. The Old Point Loma Lighthouse is located 1.1 miles from Point pt Loma Rosecrans national cemetery. The cemetery is also claimed to be haunted. One Response to "Old Point Loma Lighthouse ghost haunt California"
Fun article… My mother Lorraine Henrietta Israel (Rountree) was the grand daughter of Robert Decatur and Maria… These were my Great Grand Parents. We grew up with stories of Captain Israel and Maria. My mother Lorraine was the daughter of Henry Clay Israel.